Predator RQ-1 drone toy for ages 3 and up sells out on Amazon. Controversial Drone Toy for Toddlers Wasn’t Pulled From Amazon. It Sold Out. Drones might be a source of political controversy due to their role in “targeted killings” in places like Pakistan and Yemen. But a children’s toy version of the deadly unmanned aircraft has been a big hit on Amazon. To most parents, buying a small child a model drone to play with is probably not an appealing prospect, hence the avalanche of negative reviews on the Amazon product page. The use of drones for surveillance on American soil is currently prompting a nationwide backlash. And there remains much criticism of how the Obama administration is using drones to assassinate targets overseas, with up to an estimated 4,000 or more reported killed in covert CIA strikes since 2002. Perhaps more than anything else, the toy Predator is an acute example of how drones are becoming embedded in Western culture. 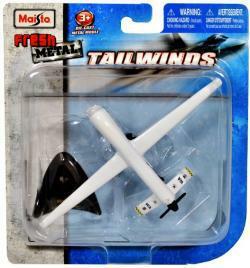 The replica, manufactured by a California-based subsidiary of Hong Kong’s May Cheong Group, is part of a series of toys made as part of a line called “Tailwinds,” which also features fighter jets, stealth bombers and an Apache helicopter. Drones are increasingly replacing these manned aircraft in real-life warzones, and governments are investing heavily in developing new drone technology. For that reason, it seems likely that in the near future we’ll see more and more examples of the creeping influence of drones—on everything from toys to fashion accessories and art projects. Research by the Pew Center, published Monday, found that “Overall, 56 percent [of Americans] approve of the U.S. conducting missile strikes from pilotless aircraft to target extremists in countries such as Pakistan, Yemen and Somalia; just 26 percent say they disapprove.” That’s the case despite a leaked Justice Department memo earlier this month concluding that the U.S. government can order the killing of American citizens with drones if they are linked to al-Qaida—“even if,” as NBC put it, “there is no intelligence indicating they are engaged in an active plot to attack the U.S.” (Also in Slate, William Saletan explains how drones were all over Obama’s State of the Union address, though he never once used the word.) Who knows—maybe Predator drone replicas will soon be at the top of every kid’s Christmas list. A range of G.I. Joe drone pilots could be next.